The purpose of the SMA Wyle Scholarship is to encourage students, who have demonstrated academic achievement and have shown an interest in Space Biology and Space Medical Operations (e.g., biomedical engineering, space flight physiology, human factors research, nursing, psychology, safety, life sciences, etc.) to further pursue a career in Space Medicine. A scholarship award of $500 will be awarded through a competitive process to an individual selected by the scholarship award committee. Application Deadline: Postmarked by March 1st. All application materials, including supporting documentation, must be received at the Space Medicine Association by the stated deadline. Incomplete or late applications will not be considered. Award Announcement/Presentation: At the Annual Meeting of the Space Medicine Association in May. Applicants will be notified of award decisions by email so they can attend the meeting if possible. The awards will be made payable to the student directly. Scholarships are open to college, university, and fellowship students in areas of study that support human space flight (e.g. biomedical engineering, space flight physiology, human factors research, nursing, psychology, safety, life sciences, etc.). Enrolled full-time in college, university, or a fellowship during the period of the award. If you are unable to access the form electronically, or would like to request a paper copy, contact the Space Medicine Association by email at: volker.damann@esa.int. Please allow one week for delivery of forms. Resume / Curriculum Vitae: Include relevant employment, education, and extra-curricular activities/community involvement. Resume/CV should also provide current contact information including email, phone, and mailing address. Two Current Letters of Recommendation: Letters should specifically address your qualifications for this scholarship and must be submitted on letterhead with complete contact information and signature. Inclusion of letters with the application package is preferred, although, if sent separately, will be accepted provided they are received by the stated deadline. You should solicit your letters from employers, supervisors, industry interfaces, teachers and laboratory directors with whom you have worked closely and who know your work well. You should be sure to inform them what the SMA Wyle Scholarship established in honor of Robert Ellis is so that they can write an appropriate letter on your behalf. Note: If sent electronically (either with the application package or separately) the letter must be sent from the email account of the individual making the recommendation or submitted as a signed, scanned document. A Scholarship Committee composed of Space Medicine Association officers and members review applications for the Wyle Scholarship established in honor of Robert Ellis. The Space Medicine Association Scholarship Committee evaluates the eligibility of all applications received, determines those that are qualified, and then selects the winning entry. If not notified of selection by April 10th, the applicant was not selected. Scholarship recipients agree to grant permission to release and/or publish requested recipient information to the Aerospace Medical Association and the Space Medicine Association. The Space Medicine Association KBRwyle Scholarship was presented to Andrew Kozminski. Mr. Kozminski received a Bachelor of Arts in Biocheminsty from Northwestern University. While an undergraduate, Mr. Kosminski participated in NASA’s Reduced Gravity Education Flight Program where he studied the effect of microgravity on the critical concentration for actin polymerization. He next enrolled in medical school at the University of Michigan. 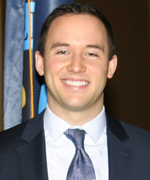 In 2017, Mr. Kozminski took a leave of absence from medical school to purse a Master of Science in Mechanical Engineering, also from the University of Michigan. He is currently working in a microfluidics laboratory, designing a device for scaled-down infection diagnostics in low-resource environments. Mr. Kozminski is the Founder and President of the Aerospace Medicine Interest Group at the University of Michigan, which directs students towards opportunities and experiences in the aerospace community. 2012 Derek Nusbaum, M.D., Ph.D.